No, John and I didn’t go to Spain for the weekend. We went to the Alps. 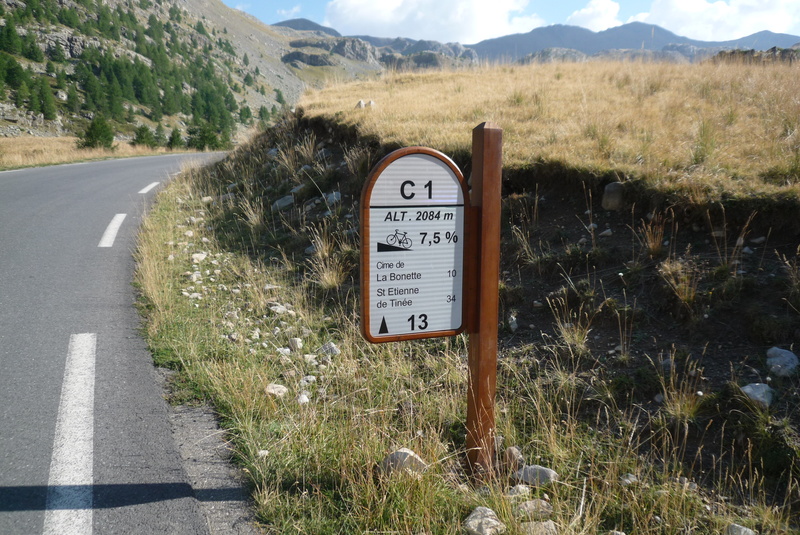 Barcelonnette is one of several ‘cycling meccas’ to be found in the French part of the Alps and we were there to do some research for a couple of cycling tours we are planning to lead next summer. 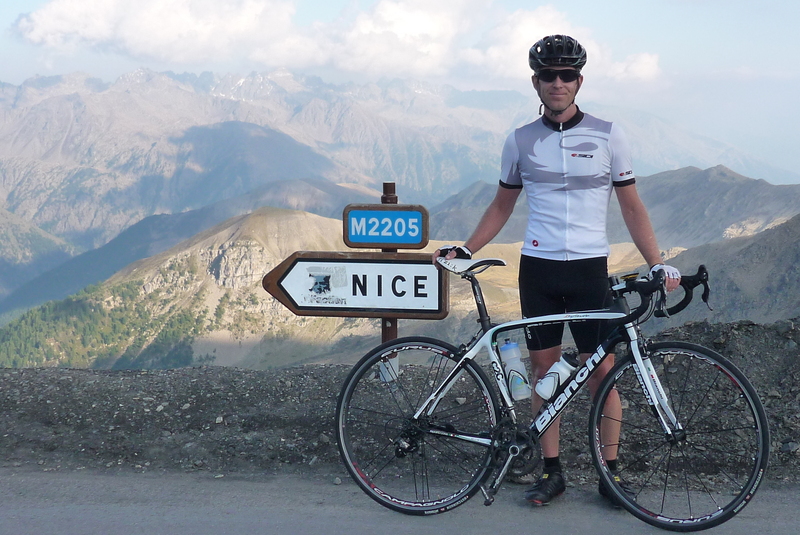 I’ll get back to oddly-named Barcelonnette in another post, but first to a little climbing. Late on Friday afternoon, after a 4-hour ride from home (how lucky am I! 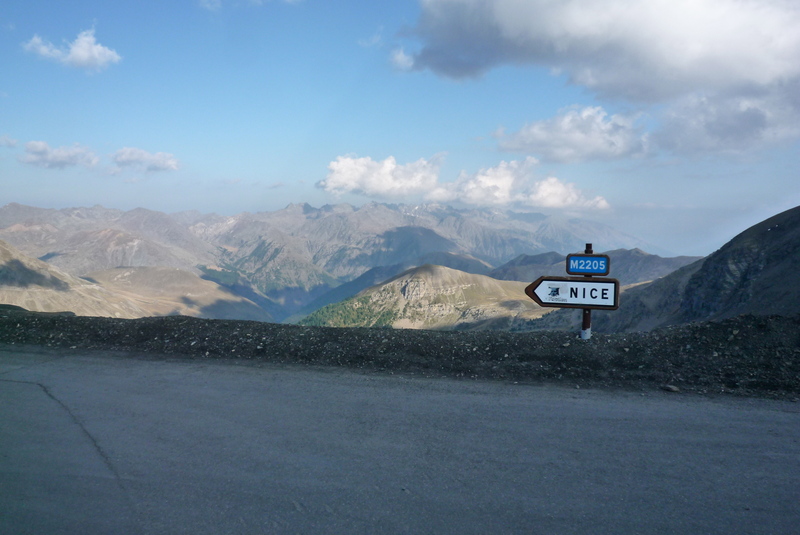 ), we decided to attack the Col de la Bonette, the highest paved through-road in Europe, as you can see for yourself from the sign (or not, as you may find out soon). We wanted to get this one out of the way first because the weather forecast wasn’t the best for the next two days. 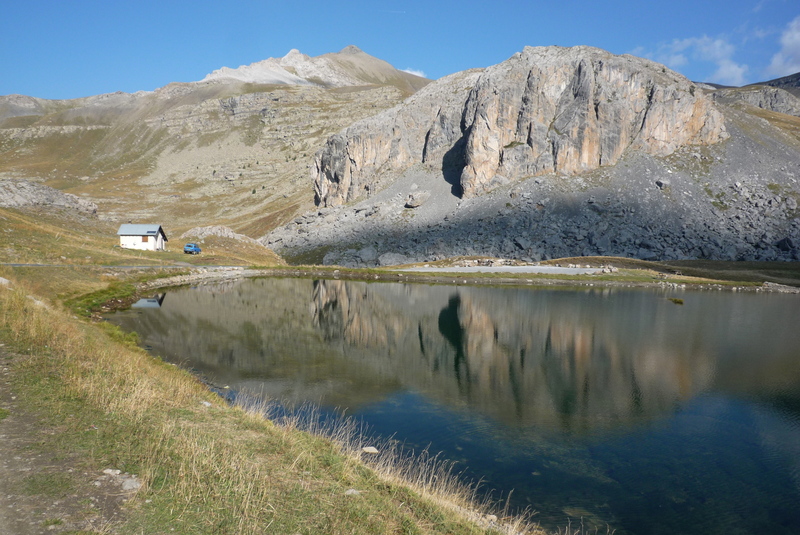 But there were certainly no signs of anything nasty that day – even in the 2nd week of September, and starting at 1200 meters up, we had nearly 30 degrees. We also had some outstanding views. 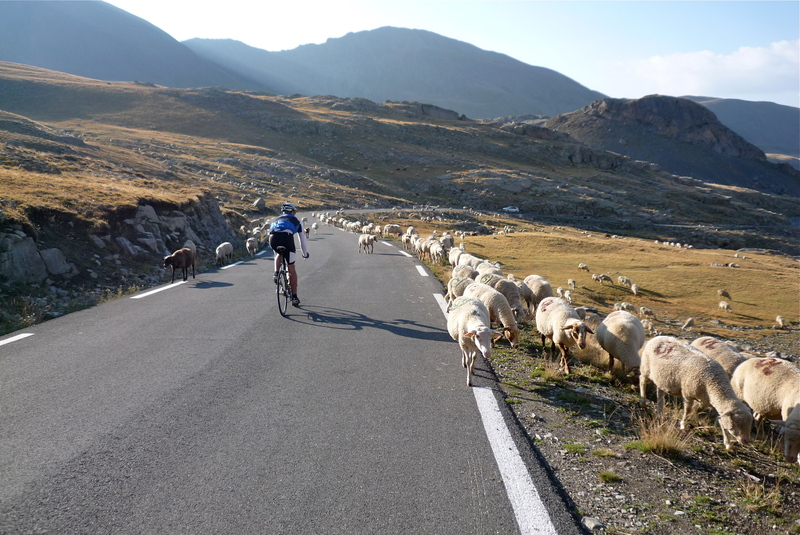 And here’s another example of the departments here in the mountains spending taxpayers’ money to show cyclists how much pain they are in for every kilometer. John, as you know, is a better climber than I am. This has its advantages for me because he usually rides with his iPhone and his, unlike my old dinosaur, takes nice photos. He needs to do something to keep himself occupied while he waits. 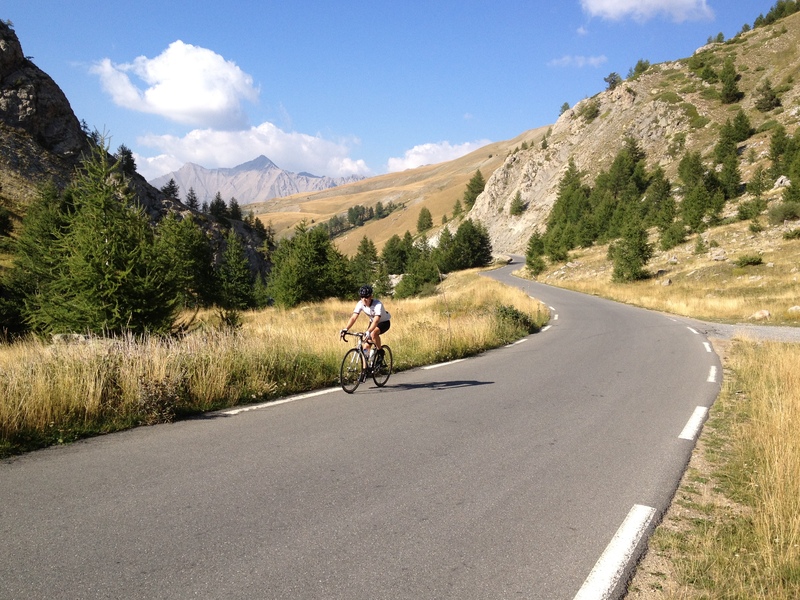 This climb, like all the others in the Alps that go over 2000 meters or so, ends up above the tree line. This is marmot country and we saw and heard a bunch of the them on the way up. I won’t put a photo in because a) the only one I have is of a marmot’s bum, and b) my wife doesn’t like to be reminded that I saw a cute, furry animal and she didn’t. This is a couple of blocks from a bunker near the top, which is part of the ill-fated (i.e. it was never actually needed) Maginot Line, remnants of which you can see all over this area (it’s very near the border of Italy). The car, although definitely ‘classic’, is not of the same vintage. Those last 2 km or so are pretty nice and flat, but what preceded it was 21km of hard slog. Or maybe it was just me. One thing I’m learning about mountains is that it’s difficult to say ‘this’ is harder than ‘that’ because so much depends on the legs you have on the day. My legs were obviously wishing they were in the place on the sign below. I thought that maybe they had just put that little sign there to offer amusing photo opportunities for guys like us, but no, our B&B hostess says this is actually the route she uses (when it’s open) to go back home and visit the family in Nice. Wow. It was getting late and we were pretty glad that we had made it to the top…till we looked up to the right. 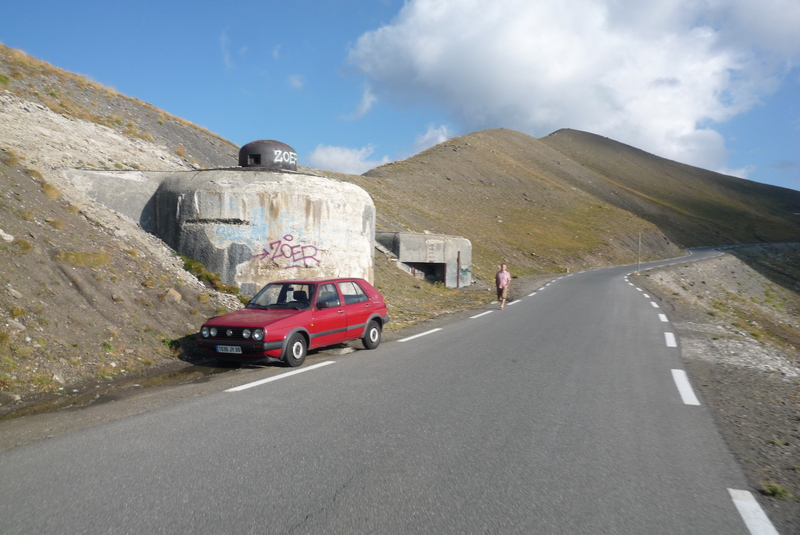 See, the mountain pass (Col de la Bonette) is not the highest paved through-road in Europe. 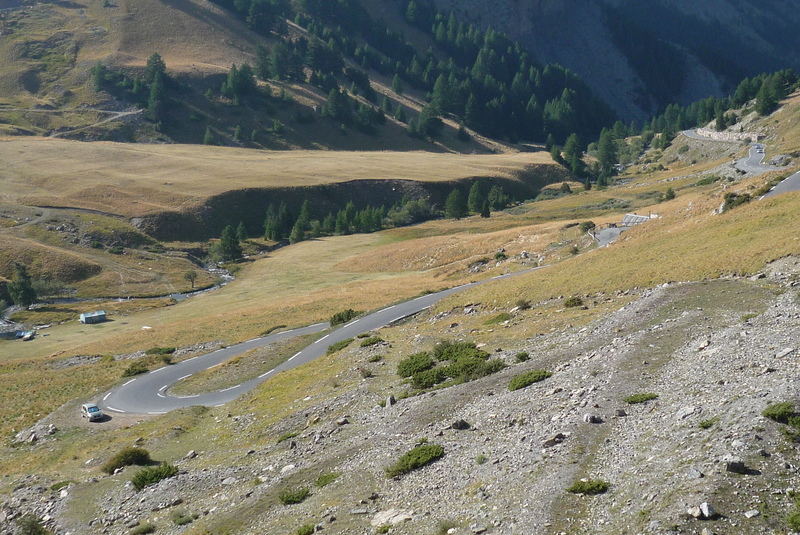 That distinction goes to that road-to-nowhere (it’s a loop) up there (Cime de la Bonette). 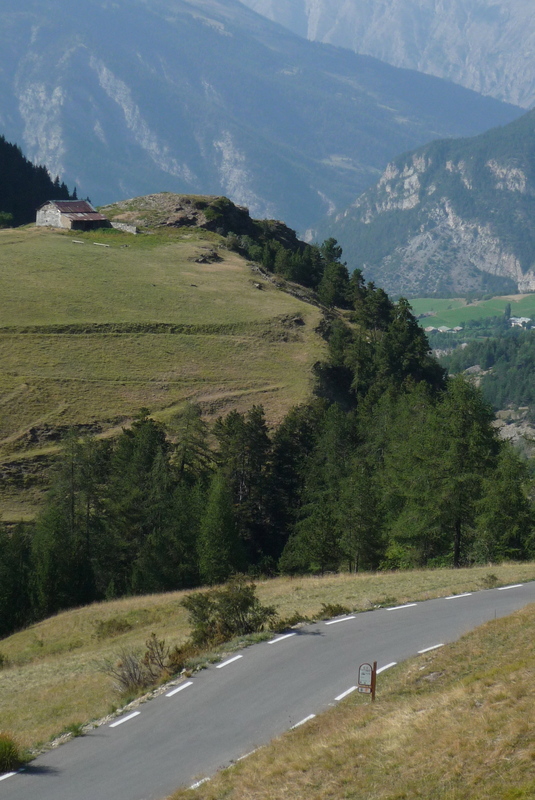 Before the Tour de France made it’s first ascension of Bonette in 1961, this loop was built so that it could out-high its rivals elsewhere in France and Italy (e.g. 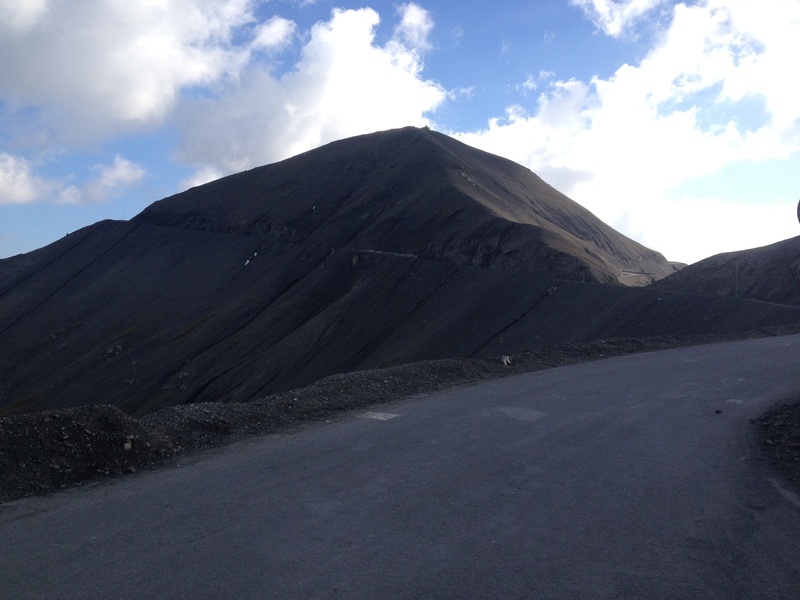 the Stelvio, at 2757m) as the highest road in a Grand Tour. I wish they hadn’t because that last bit was crushingly steep! But then, there’s always the descent to make you forget your troubles, and the descent of Bonette is one of the best I’ve ever done. As John correctly stated afterwards, it’s mostly wide open and ‘safe’, in the sense that you won’t go barreling off a precipice if you don’t get your line right. And, it’s fast. I hit nearly 70 kph at several stretches and I wasn’t even being agressive. Plus, there was traffic to deal with. The rest of our day consisted of getting clean and getting ourselves stuffed with enough food to prepare us for what we had planned for Saturday: lower passes, but 3 times as many. 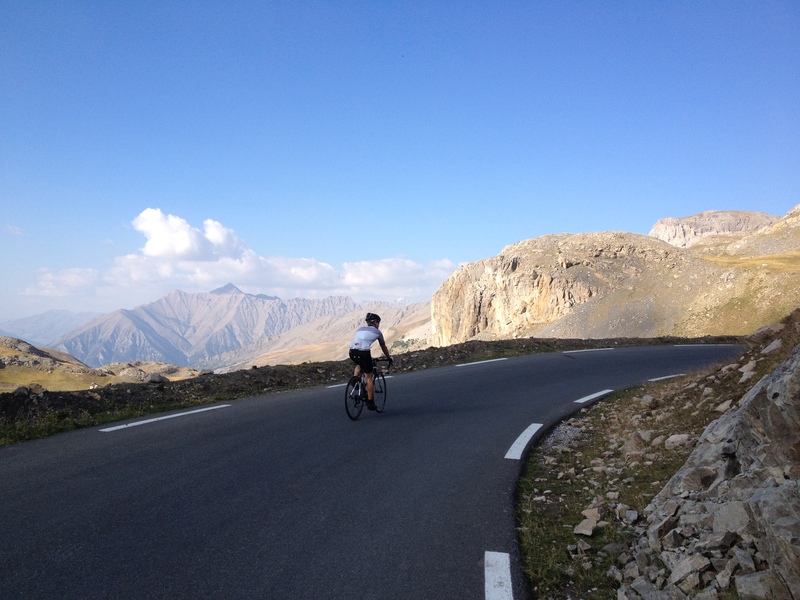 This entry was posted in Cycling, Mythic Rides / Climbs and tagged col de la bonette, highest paved road in europe. Bookmark the permalink. Excellent post… the photos do a nice job of showing how different the geology? ecosystem? topography? of the Alps is from that of the Pyrenees. Though the traffic looks about the same. The traffic is nearly identical, but your cows are bigger, I’ve found. Yes, totally different style of mountain. Next trip to France, perhaps, Suze..? What a great day out and how beautifully illustrated. I certainly wish that I had taken up serious cycling 40 years ago looking at your post. Funny, I wish I’d taken up serious cycling 30 years ago! The photos basically take themselves in the Alps, so I take no credit. You have to point in the right direction. I like your “obligatory squiggly-road” photo. Thanks Margaret, although I see now that there wasn’t much road in there. Must lean over farther next time. Fabulous ride. We don’t have marmots round here, just zillions of mulots. Fancy a swap? Even with Google it took a minute to find out what ‘mulot’ is. They look cuter than marmots, but I’ll bet they are bigger pests, too. If I happened to climb a little faster than Gerry this weekend, what he failed to make clear was his superior descending skills. My white-knuckle approach to descents, compared to Gerry’s smooth as glass turn-taking, had me wondering where I would find him waiting for me. It’s good to know we both have room for improvement! It wasn’t Montmartre at night, but we did what we could with what we had. Climbing. Yuck. Just reading the post gave me leg cramps! 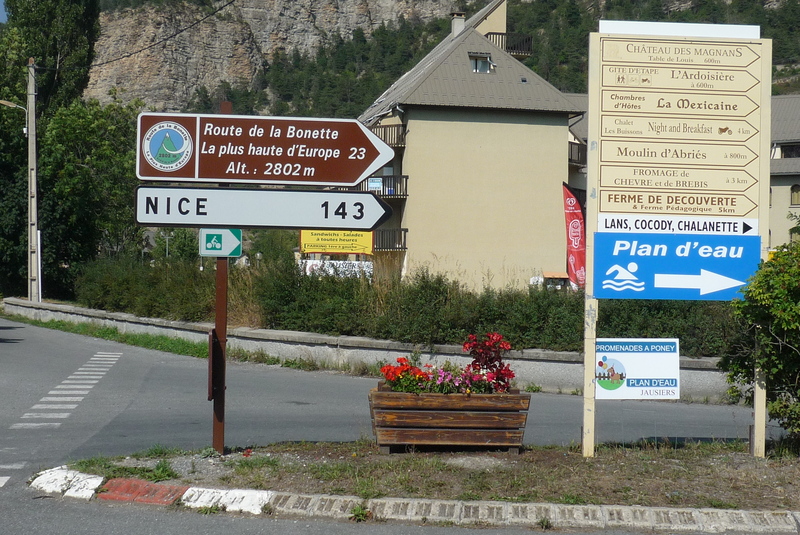 Although I have to agree with the others that the views were outstanding and getting your picture next to a sign which says Nice is pretty cool! Thanks, Steve. That Nice sign ‘really’ made me want to continue down the other side! It’s only another (very hilly) 75 miles to the Mediterranean from that point, if you can believe it. Our Tours next year will end there, so I’ll get to do it then, I guess.